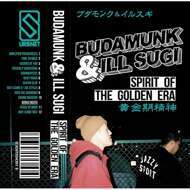 Budamunk & ill Sugi - Spirit of the Golden Era The 90s were, in many ways, the golden era of HipHop music—a time when its expression was still pure and raw. BudaMunk is one of the rightful heirs to that golden era, and together with the younger Nasty Ill Brother Sugi (who has also studied HipHop's lineage) the two artists form an intergenerational sound that honors the soul of HipHop’s remix legacy. Excavating beats from the dusty depths of HipHop’s past, the duo refashioned forgotten beat-styles (like the “boom bap”) to vibrate once again in a manner that is very different from contemporary offshoots of the sound. The “boom bap” was never truly gone—it just fell out of style. But it has returned and found a new home in the aesthetic spirit, vision and composition of BudaMunk and Ill.Sugi. These beats will surely put the diaphrams of your audio equipment to work!